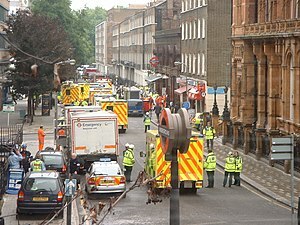 I first saw the documentary 7/7 Ripple Effect in 2007, shortly after it was released in November, and the presentation seemed to give an even better case for the July 7, 2005 London bombings being an inside job than from the evidence I had come across about 9/11 by that time. Since then, I wrote the article, What didn’t happen on 9/11, and shortly thereafter, I wrote the article, Blatant distortions in BBC’s “The Conspiracy Files: 7/7” documentary. Not long thereafter, I received notice that the producer of the first documentary, Muad’Dib, planned to come out with a sequel on the seventh anniversary of the attacks, and it has since come out, and I am including the video here. I tried getting him on as a guest on my radio program, Exposing Faux Capitalism, but it appears he isn’t doing any interviews for the time-being, so check out some of his earlier interviews on the Web. I watched BBC’s The Conspiracy Files: 7/7 documentary, and noticed some blatant distortions and propaganda. They feature several clips from 7/7: Ripple Effect, yet leave out all mention of the former head of the Israeli Mossad’s letter in the Jerusalem Post on the very day of the 7/7 attacks, saying they were carried out with “near-perfect execution.” 7/7: Ripple Effect points out that the online version of that article was removed later that very same day. At 10:43, they refer to the intact passport found at the scene of the World Trade Center after 9/11, quoting a Birmingham mosque chairman as saying it was found “intact,” yet they show a different passport — that purportedly of Ziad Jarrah — and show it as mostly burnt. That’s bad fact checking at the very least, and a deliberate distortion at worst, in deliberately making the chairman seem like he has no idea what he’s talking about. At 17:13, they point out how the official claim that the alleged bombers left at 7:40 was proven false, and the police then claimed they had taken the 7:25 train, yet the documentary provided no specific evidence for that new claim. At 49:38, they present the investigator who discovered that error with purported CCTV footage of the alleged bombers, and he is shocked, yet the thing that came to my mind after noticing camera anomalies with 9/11 is that there is no date, time or camera ID shown on the footage they showed him in the documentary! So there is no indication that the footage is from when they claim it is. Finally, they try to fool the masses with an unrelated point about him questioning the official story of the Holocaust. What he thinks about the Holocaust is independent of his legitimate findings about 7/7 which forced the government to revise their official account of events.